I've learned so much since we decided to start The Kyle Pease Foundation just six short years ago. The birth and subsequent growth of KPF has been similar to having an infant child. You care for it, you nurture it, you learn from it and teach it. You care about it more than you care about yourself. And when your precious child succeeds, nothing feels better. When our athletes experience the taste of competition and the flavor of success, my chest swells with pride. Our athletes are inspiring to me and that was on full display this past weekend in Augusta. Justin Dugan and JDUDE showed perseverance thorough out a very difficult Augusta 70.3. They experienced the thrill of victory and the agony of defeat all within one race. Victory in their decision to compete; defeat in their inability to complete the race. Results are not why we started KPF. We started KPF to show the world that "Together we can and TOGETHER WE WHEEL". Thank you to the volunteers , the countless supporters, parents and the ATHLETES. Thank you Thank you from the bottom of my heart. And now some inspiring words from Justin Dugan himself following the Augusta Half Ironman. I've been trying to process a lot of thoughts about our race in Augusta. Most of all I want to thank you. For many things. All of you extended yourselves over and over for Justin and I. I was able share some special memories with you all. I learned a lot about myself out on the bike course, both while struggling to keep that bike moving as well as when we couldn't get it going any more. It broke my heart. I sacrificed a lot for this race, time with my newborn son and family, work events and time working on my house. I felt failure. Throughout the weekend and after it, I think I learned a lot more about the foundation, inclusion and more importantly the team of people that came to support and work hard for Justin and I. You guys were my Rocks! I can't even put it into words that will do it justice. Hearing about how "we did it" so many times right after having my chip taken off was hard to hear. I felt like I failed all the people I asked for donations, all of you and everyone that was cheering us on. I felt like I didn't live up to my end of the bargain. But now, after letting it all sink in I can see the impact we had. Justin is an amazing Man and he handled this race so well. He kept checking on me and making sure I was okay. Even after the race was over. I'm lucky to have been able to share the course with a friend like him. I have written and rewritten this post already a bunch of times and know that it will not have everything I want to say and need to express. The best I can do is thank all of you again. Throughout the weekend all of you were there for us. When Justin needed someone or something it was done! And even when I needed something it was handled just as quickly and with as much care. When I've asked Brent about how I can find the motivation to do this because we aren't brothers, like he and Kyle, his response was "Out here, we are all brothers." I think that is what I learned, because I don't know if I believed him when he said that. We were a family out there. We had highs and lows and we were all in it together. We were brothers (and sisters). We did it. We were there. And just like every other athlete there, we had a shot at finishing. We dealt with problems just like every other athlete has to deal with. And we faced defeat like every athlete has to. We showed that it is possible. It seems as though I start off each blog post with the same general sentiment and that is to say, "It's a busy time of year for the Kyle Pease Foundation and our calendar is filling up by the week." That's because it's a busy time of year for the Kyle Pease Foundation and our calendar is filling up by the week. We had a record breaking turnout for the Virginia Highlands 5k and everybody seemed to have a great time including new and veteran athletes alike. Now we turn our attention to the largest 10K in the United States; The Peachtree Road Race which just happens to be in our back yard of good ol' Atlanta, GA.
We so excited that the Atlanta Track Club and the Shepard Center has allowed us to compete in the race with bibs for five teams. Just a couple years ago, Brent and I were dubbed as pioneers as the first assisted team to run this race and now thanks to these two organizations we have grown five-fold. We have a whole weekend of happenings and this is one of our biggest fund raisers of the year. 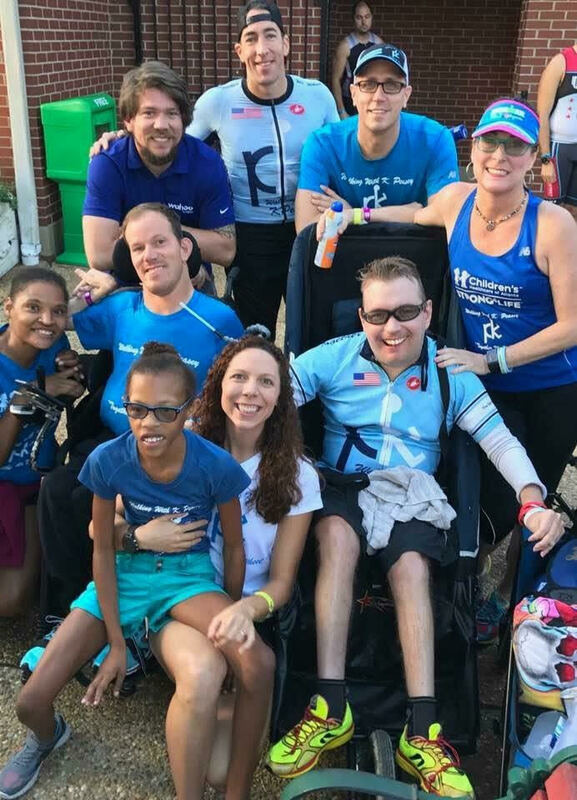 Greg and Christy Smith have graciously opened their home for an evening of fun that will highlight the Peachtree Road Race and The Kyle Pease Foundation. We are so grateful and excited to share the gift of inclusion with some amazing people. Thank you to the Smiths for opening their home to our foundation. Join us in our friendly bet where KPF Fans can wager to support their KPF favorite team at our website. This is a fun way to support KPF while cheering for your favorite KPF team. The Monday following the race, Brent and Kyle will hit the road for the 70.3 mile Half Ironman in Muncie, IN on Saturday, July 9. So as stated earlier, it is a busy few weeks. As always don't forget to apply for the Jake Vincent Family Grant and to sign up for Camp Wheel Away. And do not forget, Together We Wheel. Open a door for Kyle, and it has a tremendously positive impact on his day. Without people opening doors for Kyle, for us, we'd still be sitting outside with our metaphorical nose "pressed against the window" hoping to be invited inside. Yesterday, names were drawn for entry into the Ironman World Championships and our name was excluded. That door has not yet been opened. We both badly want to race Kona. It's been a personal goal of ours since our first triathlon together, but there is an added goal of helping to open more doors for the athletes we serve. They say when one door closes another opens, so we are now searching for another opportunity for a door to swing ajar. Racing brings us great joy, a thrill of competition we both yearn for and we hope that many doors remain open for that. To those that have opened doors for us, we thank you. For those that remain closed, we simply ask that you hold one open and help us roll through. For as Kyle says, "where there's a wheel, there's a way".